As a team of property preservation experts in Chandler's Ford with over thirty years’ experience, we recognise the importance of providing an efficient, professional and a results-orientated service. When it comes to protecting your home against damp, condensation, dry rot and wet rot, Croft Preservation are best placed to help and provide the necessary treatment to eliminate the problem at hand, as quickly as possible. Our property specialists offer an expert approach to resolving property issues in Chandler's Ford, as well as nearby areas such as: Poole, Dorchester, Weymouth, Salisbury and more. With their local area knowledge and over 30 years combined experience in the industry, the team at Croft Preservation can quickly identify and assess any property problem and provide the necessary recommendations to resolve this – whether this is a problem with dry rot, wet rot or damp. Hampshire-based Croft Preservation can help you with your Chandler's Ford property and you can feel confident in our capabilities that we will get things done. Our experience coupled with our qualifications, allows to easily diagnose and recommend treatments for a variety of issues in a property like rising damp, woodworm, flood damage and wet rot. For Chandler's Ford home owners or if you are renting in Chandler's Ford, Croft Preservation are a local company with an unrivalled reputation for our expertise and great customer service. We also have a formidable reputation with working successfully with Chandler's Ford estate agents and architects in Chandler's Ford. We provide preservation services across all types of premises – from hotels in Chandler's Ford, Chandler's Ford schools, Chandler's Ford offices, businesses in Chandler's Ford and more. 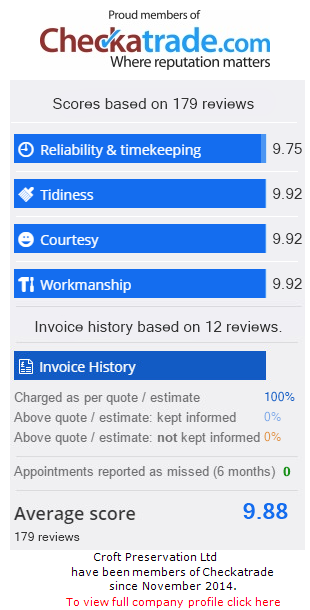 Why not take a moment to review our client testimonials from satisfied customers that showcase our exceptional work and commitment to the highest level of customer service? Enter your contact details and a member of our team will be in contact with you shortly!